I have discovered the downside of public appearances. Sooner or later, someone (like the normally-very-nice Jim Freund) is going to snap a photo of you in which you look possessed by the spirit of a deranged sprite. I think I remember the exact moment this photo was taken. I was expounding on something deep and profound: "Look!" 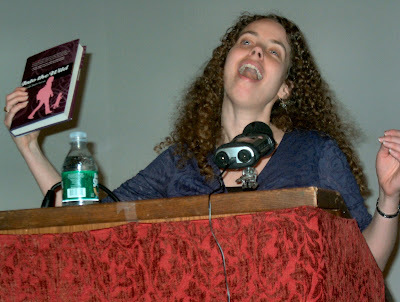 I said, waving my book in the air. "It's purple and shiny! I like shiny!" Next time, stage a wicked laugh and have lightning flash in the background. Q: I totally need to add lightning into my talks! I'm the writer of a new teen book review blog, Katie Cullen Reads, and I was wondering if I could interview you over this site for my blog. 1) If you could be a character in a fairy tale, which one would you be and why? 2) Which part of Into The Wild was the hardest for you to write? 3) If you were Cinderella, what type of shoe would you have probably left behind at the ball? 5) What are your favorite books? 7) Finally, share a few words of wisdom including the phrase "garden gnome." Katie--I would reccomend emailing her. She has contact information on her website. She's awesome; she'll respond. And it's really exciting to have an author respond to an email. Katie: Thanks so much for the great interview questions! I'd be happy to answer them. I'll post my answers here as soon as I get them written. Katie: Here are my answers to your excellent questions. Beauty from Beauty and the Beast. Yes, she has a few nasty moments when she's separated from her family and isn't sure she's going to survive. But overall, nothing too horrific happens to her. She doesn't sleep for a hundred years and wake up to find herself horribly out-of-fashion and covered in dust and spiderwebs. She isn't poisoned by her mom then entombed in a glass coffin. She isn't subjected to humiliating pea-under-the-mattress impossible tests or mocked and enslaved in her own home and reduced to befriending rodents. Instead, Beauty hangs out with a cute (albeit hairy) guy, eats nice food, wears pretty dresses, and reads a lot of books until she eventually admits she's in love and lives happily ever after. Works for me. I rewrote the ending about a billion times. But I wouldn't call that hard -- endings are fun. It's like tying up all the threads after weaving a tapestry. The challenge is how to knot the threads just right, but it's a fun challenge. (Note: I've never woven a tapestry so I have no clue whether or not that analogy makes sense.) Really, the hardest part for me is the first draft, when it goes from being a perfect idea to a bunch of pages that now need a LOT of work. I tend to do many, many drafts. Size 6 1/2 Aerosole sling-back pump. Since it's a ball, I'd submit to heels rather than my usual sneakers-with-holes-in-them, but they have to be comfy. Certainly not glass. Can you imagine walking in glass shoes? So not comfortable. Think of how bad the blisters would be by the end of the night. Fleeing at midnight would not be an option. I decided that I wanted to become a writer at age ten. It's been my dream ever since. Books have such power to enchant, and I've always wanted to be someone who creates that kind of enchantment. Curly. There's no escaping my hair. It's been ridiculously curly my entire life. I always wanted long, straight hair like Rapunzel. I do have it long now, but it's by no means straight. It requires about a bottle of gel before it agrees to succumb to the law of gravity. When I was younger, I had it short, much like a poodle. Follow your dreams. Even if the garden gnome tells you not to. Especially if the garden gnome tells you not to.